We've never needed you more than we do now. IVAW has a rich and powerful history as evident in the newly released 10 year poster project "Celebrate People's History" and we want to see a future that is even more powerful than the last decade has been. The last time IVAW hosted an organizing gathering like this was in May of 2010 in Chicago, IL where we work-shopped through potential issues for IVAW to work on and came up with Operation Recovery: Stop the Deployment of Traumatized Troops, which over time morphed into the Right to Heal, and addressed the impacts of war on US service members and veterans as well as the people in Iraq and Afghanistan. US Militarism Abroad: War, Occupation, Military Intervention There is so much US led, funded, supplied and supported military violence happening around the world that it is hard to keep track of. The US is actively engaging in a bombing campaign in Iraq and Syria, overshadowed by the constant "threat" of war with Russia, Iran, or even China. How can we address this system instead of choosing which of the many conflicts to address? Rights, Care and Healing for Veterans And Service Members Part of being a community dedicated to justice is recognizing the humanity in one another. There is no doubt that most of our members consider ourselves to be deeply impacted by our time in the military. When so many are struggling with health and mental health care, and meeting basic needs we must be here for each other and stand up for or own rights, dignity, and healing. What do you think are some pressing issues that our community is facing that IVAW could impact? Reparations and International Solidarity Reparations has always been a point of unity for members of IVAW since our founding over 10 years ago. The people of Iraq and Afghanistan have yet to see justice in the form of reparations, they've yet to see an end to the wars waging in their countries. With millions displaced and currently at risk those impacted by US militarism are refugees from their homes and/or still in constant danger of violence. With so much need how do we work to recognize those most impacted and how do we remain committed to their right's and dignity? Militarization of Schools and Streets Recruiting kids and teens, school to jail pipeline, aggressive policing are happening within schools with disproportionate impact on kids of color. These are all reasons to stop the militarization of our schools. Beyond the classrooms and into communities of color police violence is being exposed by organizers and activists in Black Lives Matter and the anti-police brutality and anti-white supremacy groups standing strong and demanding black liberation now. We support this demand for justice and seek ways to oppose the militarization of the police. We listen to those groups made up of the people most directly impacted by police and other state-sponsored violence. Have you/has your chapter been working with these groups or causes in your local area? Accomodations Meals are included from Friday lunch through Sunday lunch. There is camping space, cots indoors and hotel rooms available (indicate needs on registration). Registration is a sliding scale $25-$100 donation, payable online or in person at the event we ask those requesting a hotel room give the full amount if able. Click here to register now. We have up to 15 travel scholarships available and you must register to be eligible for travel funds. Contact me at [email protected] to request travel support or with any questions or concerns. I'm excited to be entering this next phase of IVAW. In seven years of being an IVAW member and nearly four years on staff I've been transformed by this community and I've learned so much from all of you along the way. I look forward to seeing new leaders stepping up and taking ownership with the organization along with some of the earliest members who have brought us to this point. We can impact the future, I hope you will take this opportunity to recommit to the struggle to end militarism by transforming ourselves, military culture, and American society. 2:00-5:00 Where have we been, where are we now? Bring Complete SWOT analysis to add to, Matt’s summary of Operation Recovery lessons learned. 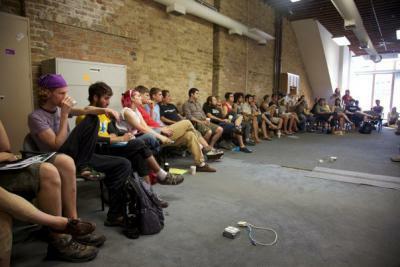 Goal: Share highlights of lessons learned in IVAW’s organizing experience, examine IVAW’s current capacity. 6:00-6:15 Welcome, vision for the weekend, thank guests. Goal: Set the atmosphere and intention for the weekend. 6:15-7:15 Presentations and Q&A from Detroit Organizers. Goal: Learn about the place we are meeting to instil respect and appreciation for local struggles. Get inspired about possibilities in our own work through hearing about other groups. 7:15-8:30 Group discussion on ways we can increase our current capacity. Goal: Come up with a solid list and get a sense of what the best capacity building tactics to incorporate into our work. 10:00-10:30 Opening and reflections from Friday night. Goal: Get present in the space, remember the work and thinking we did the night before and how it flows into our goals for the weekend. 10:30-11:15 Revisit purpose and goals of gathering, talk about agenda and facilitation, community agreements, gradient of agreement, decision-making and considerations for structure. Goal: Remind the group of the purpose of the weekend and the process we will use to get there. Address any concerns. 11:00-12:30 Begin intros and presentations (presentations from strategy team first for each issue area, then the members most interested in that area have their turn) Map the ideas people share on paper wall). Bring mapping wall with categories that make mapping easier. Goal: Let each participant share what is important to them and map how our interests are interconnected looking for commonalities and intersections as places to focus on. 2:30-3:15 (Flex Time) Goal: leave space in the agenda for going over time or for additional items the group needs to address. 3:45-4:30 Review all the ideas people shared in intros and summarize our SWOT analysis. Goal: identify what we want to do and what we have to work with. 4:30-5:15 Where do we fall short? Goal: Think of outreach tactics that are to scale with our current capacity AND help us build our capacity? 5:15-5:45 Working break Goal: think about how our political goals and our capacity goals overlap and work together. 6:00-6:45 Map out connections, overlaps, and ways that multiple goals can work together. (either returning to map we made or making a new one) Goal: Build consensus around areas of overlap that we are leaning towards. 6:45-7:00 Reflect on common themes and overlaps, suggest areas that may be standing out as paths to pursue. Goal: Hear where the group is at the end of the day and build into facilitation team proposal. 10:00-10:30 Go-round on things you’re excited about from the days prior. Goal, re-entering the work space, remembering what we did as a group to continue our process on this last day. 12:00-1:00 Teams meet. Goal: determine point people and secondary point people, communication, short and long term goals, fundraising needs and ideas for each goal. 2:15-2:45 Report-backs from teams on: point people, short and long term goals, communications/VOT rep Goal: document teams and point people build sense of group accountability. Housing is "crash space" and camping on site for free or a nearby hotel with cost split between participant and IVAW. Limited travel scholarships will be available.